Some time windows take too much time to kill the process or stop service once you give the Shutdown command. But, in most of the case you see it took a long time for shutting down windows. So in this post I am going to write about the simple trick through which you will be able to boost up your shutdown time. In most of the case it does not harm your system when you reduce the shutdown time. 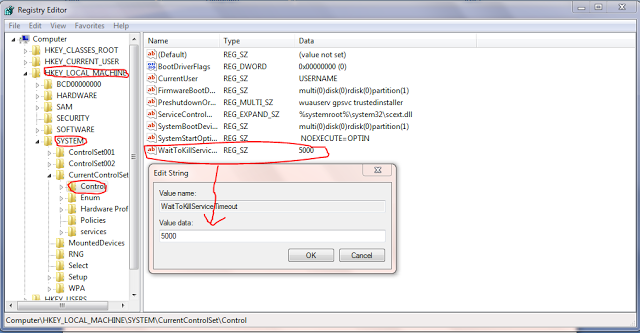 Now navigate to HKEY_LOCAL_MACHINE > SYSTEM > Currentcontrolset > Control in the left pane. Now In the right pane, right click on the key called ‘WaitToKillServiceTimeout’ and click on modify. Now you need to change the value data from 12000 (that is 12 seconds) to 5000 (that 5 seconds). To be on the safe side do not reduce below 5 seconds because some of the programs need a couple of seconds to close properly and killing before that may results in data loss. That’s all, now restart your PC and afterwards you will notice the change. Please don’t play with registry files if you are not advanced user. Your system may crash if you change registry files everywhere. Know what you are doing else it may harm you.